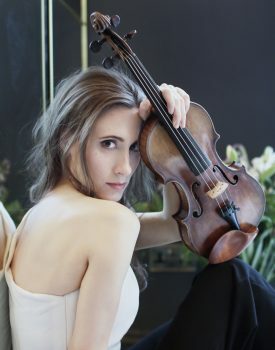 LONDON—With her latest recording, violinist Jennifer Pike has been rediscovering her Polish roots. The Chandos disc “The Polish Violin,” with pianist Petr Limonov, is a program of music by Karol Szymanowski, Moritz Moszkowski, Mieczyslaw Karlowicz, and Henryk Wieniawski. But the program is more than a musical exploration, as it connects Jennifer with her Polish grandparents and brings out the importance of European connections. She recently played a concert in Katowice, Poland, where she met 10 of her family members for the first time. I met up with Pike to talk about the disc and about her Polish connections. Keen to get in touch with her Polish side, Pike, in the last few years, has been exploring the wealth of violin and piano repertoire by Polish composers. Some of these pieces have lain undiscovered in Western Europe. In fact, another reason for making the disc is to encourage others to play this music more. While the works by Wieniawski on the disc, “Légende” and “Polonaise de concert,” Op.4, were already on the soundtrack of her life, others were discoveries. Pike found Mieczyslaw Karlowicz’s “Impromptu” to be a real discovery: one of a number of works that are just being discovered in the musical world, as many were lost during World War II. Karlowicz’s “Impromptu” is in his late Romantic style, whereas other works by him, such as his late orchestral piece “Eternal Songs,” are in a more adventurous style. Clearly Tchaikovsky is an inspiration, yet Karlowicz is also imaginative. Karłowicz had died young in the Tatra Mountains, his homeland, in an avalanche. 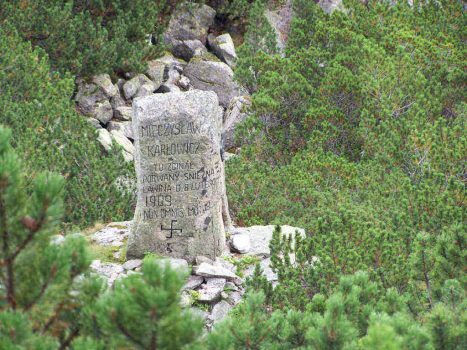 Pike remembers when she was little, her grandparents told her about the event as they walked past a plaque to Karlowicz on a visit to the Tatras. Much of the music from composers like Karlowicz remains buried, with the scores and parts difficult to get hold of. In fact, this is a problem with which Pike is familiar; she has recorded the Miklos Rozsa violin concerto, but the orchestra accompanying her had a difficult time finding the parts. The music we do have from Karlowicz is wonderful. Pike hears in the music the panoramic views of the Tatra Mountains’ landscape—an area she walked a lot when she was a youngster. Thus, listening to it makes her feel connected to this scenery. The disc opens with Karol Szymanowski’s “Mythes,” the first one of which is the most famous in violin circles. It is also the most accessible of his works. 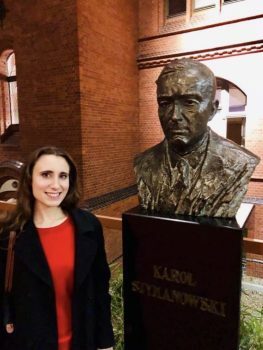 Pike feels that, in general, Szymanowski’s writing sounds so modern that it is hard to grasp; the last movement has been described by composers as a new form of expression for the violin. Pike first played Szymanowski’s “Violin Sonata” (one she would love to record) before she encountering “Mythes.” She thus learned them in the correct historical order of their composition, and so she was able to appreciate the changes to his style. Szymanowski’s “Romance,” also on the disc, is a work in which we hear his adventurous new, even strange world of sound. Another Szymanowski piece on the disc, “Chant de Roxanne,” is arranged from his opera “King Roger” by the violinist Pavel Kochansky. Pike describes much of the music on the disc as dark yet optimistic, which she feels reflects the Polish character. It’s poignant and melancholy, “zal” in Polish, she says. Creating the album has allowed Pike to explore both sides of her character, the reserved British and the more tempestuous Polish. She’s seen these differences on both sides of her family. In thinking about her own personality, she recognizes that while she did fit in at her English school, she always felt a bit different. And in Poland, she never felt 100 percent Polish. Growing up, Pike was very aware that her mother, Teresa, who spoke the language, was Polish, and the family visited Jennifer’s Polish grandparents in the Tatra Mountains every few years. In the Tatra Mountains, there was so much tradition to get immersed in. In fact, Jennifer communicates with her grandparents in Polish, a language that she wants to get better at. But when she was young, Pike didn’t understand how much her parents had been through. She knew some anecdotes, but she did not grasp the realities of life under communism in Poland. For example, a lot of what her mother learned in school, such as her history lessons, were politically skewed, and her mother had also seen the tanks going through Poland. Pike’s grandfather was a miner at the time and was placed under great pressure by the communist regime. Only gradually did Pike become aware of her parents’ bravery. Her father, the composer Jeremy Pike, received a scholarship to study in Katowice, Poland, with Henryk Gorecki. There, he met Teresa, and they were married. When he left Poland, his wife was meant to follow, but they were separated by the declaration of martial law. So the couple could only communicate via letters sent in diplomatic pouches, and even then they were censored by the communist authorities. Pike, who was born the day the Berlin Wall came down, finds it scary and unbelievable that such difficulties from her parents’ younger days could repeat themselves in the present. There was a piano at home when Pike was growing up, and she just had to make a noise on it. But there was something about the violin that struck her, something tactile. She admits that if she could sing, she would have, but playing the violin seemed the next best thing. Pike’s mother had wanted to play the piano, but she was discouraged by her parents; Pike’s grandmother had wanted to play as well, but she had also been discouraged and became a doctor. ‘Mum got her own back by marrying a musician,” Pike said. Pike started playing violin at the age of 5, and won the BBC Young Musician award when she was 12. 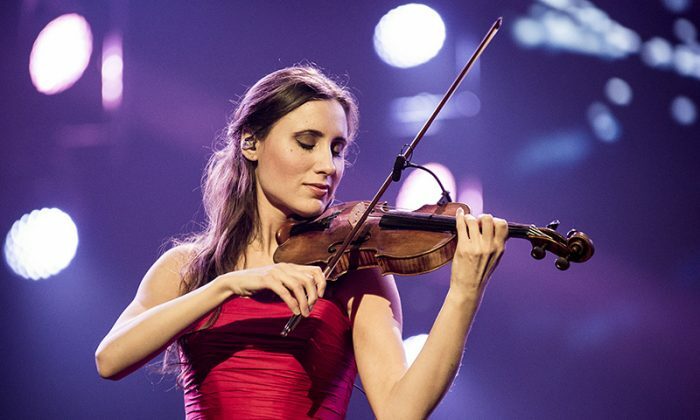 She feels lucky to have made a natural transition to being a professional violinist and only gradually realized she was performing for a living, something that didn’t strike her when she was learning. There was never a time when she didn’t want to play. Her first experience of being tremendously happy was playing to an audience. That is not to say that the transition from youthful player to adult was not very difficult. But at 29, Pike has been playing the violin a long time, with around 18 years as a professional. This means that she has a strange relationship with herself and the world. As a young woman, she was changing quickly, but the world’s perception of her changed at a far slower rate. When people put labels on her, it made it difficult for her to grow and develop as a musician, yet she had to leave the labels behind. She adds, only half joking, that she would love to have a sprinkling of gray hair to get the message across that she has been around a long time. She has also learned that balance is important: In addition to playing the violin, it’s important to live life. This is one of the reasons that she went to Oxford for a few years to study. (She graduated with first-class honors in music from Lady Margaret Hall, Oxford in 2012.) She was still performing, but at times she was just sitting in a library reading a book. Robert Hugill is a composer, lecturer, journalist, and classical music blogger. He runs the classical music blog Planet Hugill, writes for the Opera Today website, and Opera Today and Opera magazines. He lectures and gives pre-concert talks on opera and classical music in London. As a composer, his disc of songs “Quickening” was issued by Navona Records in 2017. This article, edited for brevity and clarity, is reprinted with permission from Planet Hugill. Here is a look at our selected photos of the day from all around the globe that truly inform and inspire so far for 2016.